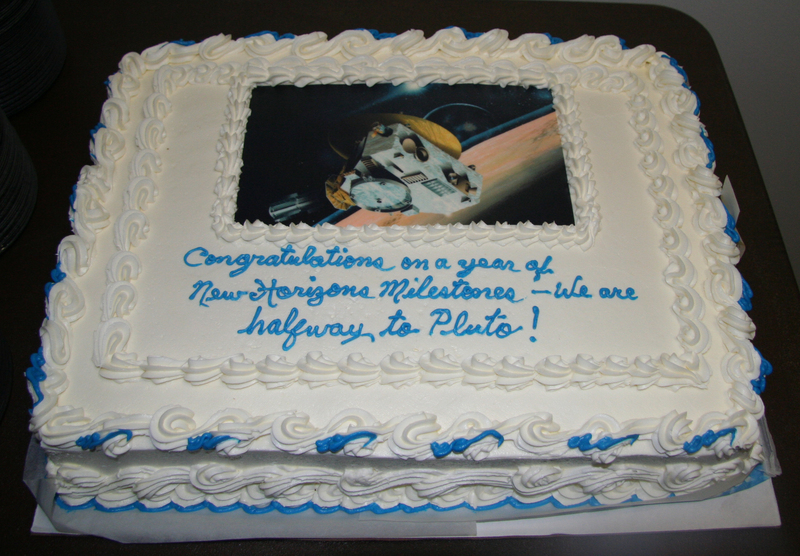 NASA's New Horizons mission team marks four years of flight today – and their Pluto-bound spacecraft is sleeping right through the celebration. Operators at the Johns Hopkins University Applied Physics Laboratory in Laurel, Md., commanded New Horizons into hibernation on Friday after 10 days of maintenance, during which they downloaded Student Dust Counter data from the solid-state recorder, uploaded software updates to the Solar Wind Around Pluto (SWAP) instrument, made minor adjustments to the spacecraft’s fault-protection system and collected navigation-tracking data. 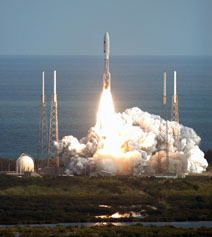 New Horizons, which launched from Cape Canaveral Air Force Station, Fla., on Jan. 19, 2006, is more than 1.4 billion miles from the Sun – and closer to Pluto than its home planet. “We’re nearly 1,500 days into flight, and many space missions don't even last that long,” says New Horizons Principal Investigator Alan Stern, of the Southwest Research Institute. “We already have much to be proud of – the fastest spacecraft launch from Earth, and an incredible Jupiter encounter [in early 2007] that could have been a mission in itself. Amazingly, we still have 2,000 days to go before we reach Pluto." The New Horizons science team gathers for its annual meeting today and tomorrow at APL. Among the status reports and discussions of Kuiper Belt Object search plans and data-collection opportunities during the cruise to Pluto, you can expect some reflecting on the start of New Horizons’ historic voyage. 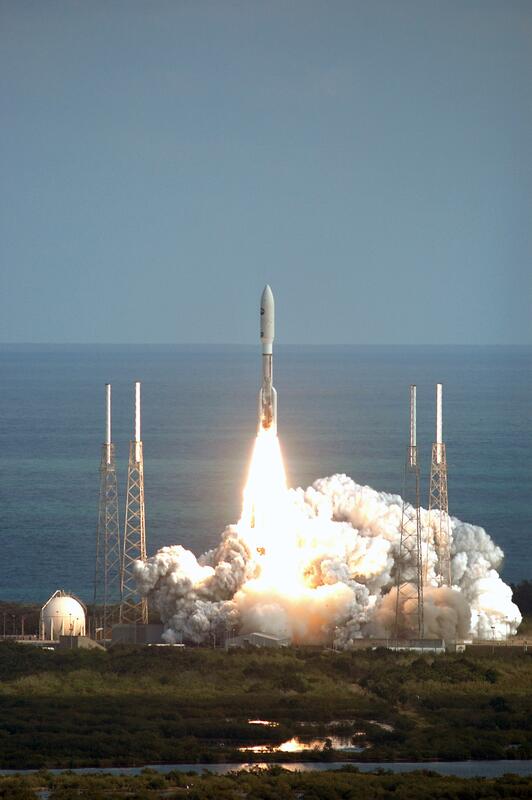 “It doesn’t seem like it’s been four years since New Horizons was launched because we’ve had so much to do during this time,” says New Horizons Project Scientist Hal Weaver, of APL. Weaver says that after the science team completes most of its Pluto encounter planning this year, it will turn attention toward the data they expect to get out of New Horizons – and optimizing that by pushing various facilities (such as large ground-based telescopes, new space telescopes and networks of small, mobile telescopes) to learn as much about the Pluto system as possible before the New Horizons flyby in July 2015. 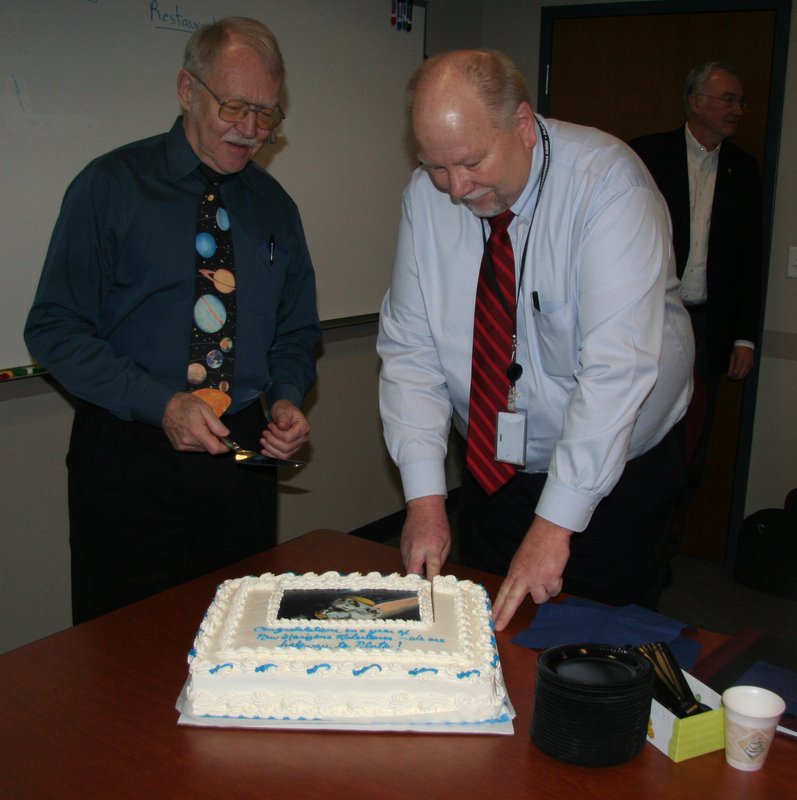 At 2 p.m. EST on Jan. 19, 2006, New Horizons roars off the launch pad aboard an Atlas V rocket from Complex 41 on Cape Canaveral Air Force Station, Fla.
Denis Bogan (left) and Kurt Lindstrom cut the cake to celebrate New Horizons’ fourth launch anniversary during the New Horizons science team meeting at the Johns Hopkins University Applied Physics Laboratory on Jan. 19. 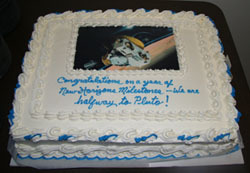 Bogan was the New Horizons program scientist at NASA Headquarters when the mission launched in January 2006; Lindstrom, now at APL, was the NASA New Horizons program executive.